This house in the Ansley Park neighborhood of Atlanta was built in 1900, but you’d never know it by the way the kitchen had been remodeled by the previous owners. “It just felt very unfamiliar to the home’s history,” designer Ili Nilsson says. She took on the challenge of giving the room more character, functionality, and light, and the results are impressive. Take a look! It’s amazing how much bigger and brighter it looks. And I like how they reworked the steps up into the kitchen. They look a little less treacherous now. They also took out the corner pantry and added two new windows, which made a big difference. A cedar-wrapped beam divides the kitchen from the eating area and built-in bar. I’m going to play Devil’s Advocate on this one. Although the white cabinets and new layout of this kitchen are lovely, it seems a shame that the new owners would tear out a perfectly functional (and newish) kitchen. In this era of environmental consciousness, I think we must be mindful of the amount of waste we’re creating. Just because someone has the money to gut and re-do, is it always the right thing to do? Also, I think the bar area looks a bit slick and modern for a Victorian. I do love the cedar beam. How do you know that they didn’t recycle or repurpose the old kitchen? I have thought that too about about all the remodeling projects I have seen over the years. I am glad they donated the materials BUT I have seen on HGTV so many times perfectly good materials go into a trash bin. It is a beautiful new kitchen. The bar area was a little strange for my taste and I would eventually bump those lights off the wall in no time at all. Can anyone tell me what that chrome is below the microwave? It looks like a handle to something? I’m not sure but if you follow the link to the article you’ll find a lot more information there. Maybe they mention what it is! I live in Europe. Warming drawers are popular here. That’s what it looks like to me. Gorgeous kitchen! I’m in love! Wow! Beautiful! What a transformation! I love the idea of bringing the style and character back to a period home. The island is spectacular, the windows are stunning, the cabinetry is beautiful and that range is on my ‘covet list’. I agree with your comments on the stairs, Julia. Thanks for sharing! I think the “new” kitchen is an improvement over the dark one you seem to see everywhere. The room seems more open to the eating area and you can sit at the work island and visit with the cook without leaving the kitchen. It looks like they reused the pendants from over the former island in the area infront of the new kitchen windows. They look to be the same. ps is Maizie tiried of winter too? mine are “done” with it. Hi Rick! This winter has definitely been tough for dogs (and their owners), hasn’t it? Not a good time to be a little dog with short legs when the snow is so high, either. Poor things. Wow! This might be my new favorite kitchen. Gorgeous and whimsical at the same time. Love Alie B’s comment – she says exactly what I feel ( I’m always the person who usually thinks the ‘before’ pictures are perfectly fine). It takes much more imagination to recycle, repurpose, rethink a room – or an entire house! I still think of my favorite designer, Betsy Speert, who took a radiator cover, turned it upside down and used it as a cupboard in her seaside cottage . . . it was fantastic and certainly one of a kind. Thanks, Karen! 🙂 I admit I was a bit nervous writing and sending my comment. I hate to come across in a negative way on this feel-good site. Love the radiator cover idea! Perhaps the builders recycled as much of the old kitchen as they could. Meanwhile, I love the new kitchen tremendously. I must have a rolling library ladder someday! I’ve been considering putting a beam between our kitchen + dining room. This may be the prompting I need to forge ahead! I think this is a fabulous re-do. The former kitchen was totally out of keeping with a house of that era and could have come straight from the showroom of a big box home improvement store sampling the trends du jour circa 2000’s. The dropped ceilings, soffits, and sheetrock framed openings and back of the peninsula, the corner pantry and the angled stair, all look like a typical builder’s approach to a 90’s-00’s track house. The current kitchen bridges the gap between old and new and fits the integrity of the wonderful houses of that neighborhood. I read the owner’s comment on Houzz that the old cabinets were repurposed – given to a relative and Habitat for Humanity. Thanks for pointing that out, Carolyn. The cabinets weren’t right for this kitchen, but at least someone else can use them! That’s awesome that they didn’t toss them into a landfill. That’s great that they do that. Seems like a win-win for everyone! I can’t believe you got that door for $10 bucks. Wow. What a score! I love the lack of toekicks to make the cabinets look like freestanding pieces. It’s just a couple inches, but I think it adds an important airiness to the room. And while I bet the owners don’t care for it, I sort of love how the stairs define the kitchen. Yes, I would be quite happy in this kitchen. The ‘After’ is a very beautiful space. Not too overdone either. The ‘Before’ was a functioning newer kitchen, but it was dark, dreary, and had weird corners and angles making the room/counter space look cramped; it also obviously didn’t fit the owners personal style nor meet their needs. Sometimes a fresh coat of paint and reuse/recycle can only take a room so far. There is something to be said for being happy with the space you occupy every day and not just ‘put up with’ it. I totally agree. If anything, I would lay the blame on the previous owners who would put that type of dark kitchen into a turn of the century home. I applaud the new owners for bringing the kitchen back to something much more appropriate for the era. Why live with something you hate when you are able to improve it? Kudos to them for creating a beautiful space AND for donating the old fixtures. I think Alie B. raises a good point and I know I’ve felt a little frustration at times when I hear of people demolishing a perfectly functional space. It’s nice to hear that the owners donated the cabinets and kept the lights. The floors look like re-milled old wood, or else the original floors uncovered? Anyway, the old kitchen was so dark and inappropriate to the house that I can hardly blame the owners for tearing it out. While I can certainly see why the people with enough money to buy a La Cornue would choose to gut that dark icky kitchen, I also agree that it’s a shame to waste all those relatively new fixtures, cabinets, finishes, etc. So I’m glad they reused and recycled. Hopefully making the kitchen fit the era of the house better will keep the next owners from feeling the need to gut. If I was the next owner I’d keep it all, but I’d probably repaint the black pieces to a happier color (it’s a little slick for me) and re-cover the banquette back. That’s it though – very pretty! Wow. Day and night. I thought I liked some of the before, until I saw the after shots. That white is stunning and very appealing. And the wood flooring adds to the warmth of the home. Very classy. Wow, what a transformation! I love how this kitchen looks now, and could move in and not change a thing! The eating area is so pretty! I die for that stove!!! Whenever I renovate I try to find ways to salvage as much as possible and not throw it in the dumpster – much to the chagrin of my contractor. I put a lot of things on Craigs List for free or almost free and you’d be surprised how many people are in the market for things to paint or repurpose! Groovy. It’s like French Steam Punk. I don’t think I’ve ever seen anything quite like it before. It’s beautiful. Am saving this one for reference! All those steps would drive me crazy…you will know when you get in your 60’s and get your first pair of bifocal glasses. This is a real transformation and very well done. I like the white with the wood floor and the relaxed vibe. This is one I will refer to again. this is great, one of the most thoughtful remodels i have seen on your blog. i love how the owners were brave enough to completely redo a kitchen that was ok/fine and functional and turn it into a timeless, beautiful space with even more functionality (i could just see my husband if this were my kitchen and i broached the subject of gutting/renovating…”but, but, but…it’s just fine the way it is! i like the dark wood and the penisula and the tile! !”) and so much more room and beauty. it looks like they added even more storage space without it seeming that they were just cramming in as many extra cabinets as possible. just a great example of how trading out boring, builder installed materials with basic wood, better lighting, etc. can transform a room. on the kitchen storage subject…the previous owners who remodeled our early 1930’s home were so smart in the small kitchen. one of the best things they did was use the space under the cabinets that is just typically molding and turn it into long, shallow, pull out drawers. i have seven of these that are so hidden i did not find them until well after we had moved in. the perfect place for platters, barbeque equipment, etc. i have them all filled and have to say that this is the best usage of normally forgotten space that i have ever seen. serious kitchen envy here…clearly this family is part of the ‘ten-percent’ club! First of all, Julia , thanks for a wonderful blog on all kinds of houses. You do a tremendous job on such interesting homes each week. I look forward to every post. Having lived in turn of the century homes almost all my life, I always find it interesting when owners say they renovate to be more sympathetic to the period of their historical home. And then they put together a very large,open, white and airy kitchen. During the turn of the century, kitchens were strictly functional, usually small, even in larger homes. 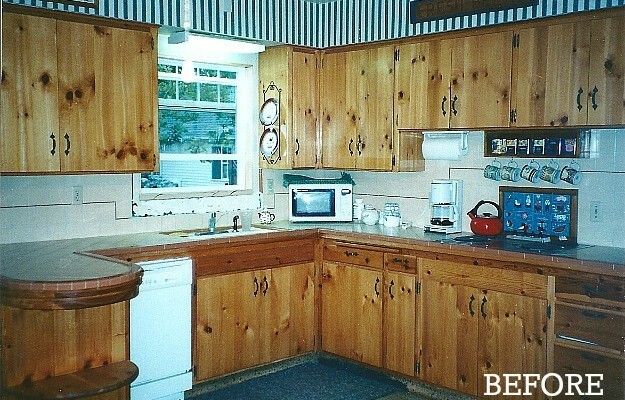 They used Hoosier style, unfitted cabinets and tables in medium to darker woods. If they used paint, they were dark colors. It wasn’t till the 1920’s when the science of germs was discovered, that white,enamelled appliances , and white tile work began to appear in kitchens and bathrooms. The “modern” housewife wanted to be very sanitary. I don’t think any of us, would really want a 1900’s kitchen. 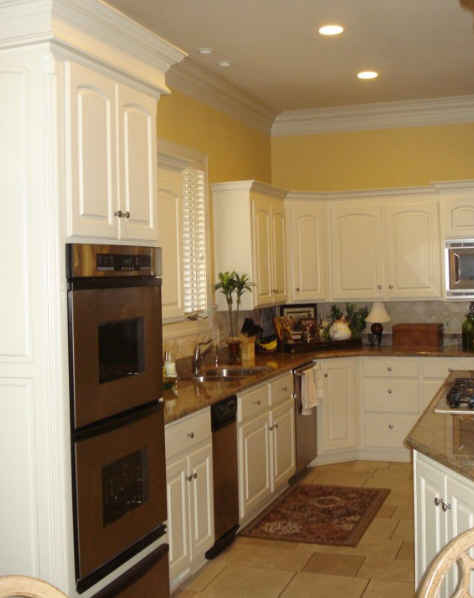 I love white kitchens, I have one myself! Wow, the reno is absolutely gorgeous. Massive improvement on the prior room, even though the “before” was a perfectly acceptable, functional space, it just didn’t fit with the history of the house. The after is much better. Glad they donated the perfectly good materials, but I’m noticing this is a major, major reno and with that $8,600 stove, these people obviously had piles of money to burn on this gut-and-redo. What an amazing transformation! I love how the kitchen has much more light and it looks a lot bigger. The before was nice, but it was too dark. WOW! I Love the after! White is always refreshing in the kitchen. I love this kitchen. I had ‘re-pinned’ the first image a couple of weeks ago, but the original pin didn’t link to a source. I was dying to find the original source and see if there were more images and information. Imagine my delight this morning to see this post with MORE images AND the link! Thanks again! I love your site. I have always loved a white kitchen, but I love the warmth that the cedar brings. Who knew there was a beautiful black bar and banquet on the other wall? 🙂 Just perfect! Gorgeous! I love the warm woods with the white. For those complaining that this remodel was a “waste,” have you ever set foot in a Habitat for Humanity Restore? Based on the pictures, I’d bet the only material not donated was the tile flooring, as that breaks up during removal. Cabinets, hardware, light fixtures, woodwork, windows, appliances … all can be removed without damage and donated for resale. WOW! I have done a lot of kitchen remodels and i am still amazed at how much bigger they look by adding a couple windows and making them bright white. Much respect to the builder. I’m just so happy to see one of those builder type dark cherry/granite kitchens get such a wonderful make-over…and it suits the house so much better. There are many perfectly ‘functional’ kitchens that are either eyesores, or inappropriate for the period of a house, the latter really gets to me, this remodel is so refreshing… and beautiful. In the future, when all our natural resources have been exhausted, I hope our offspring are satisfied with the fact it was all for the sake of giving a house a “new look” that was more in line with the current owners style/preference.